In a rather cool move, Sport Smoke has released a line of electrically triggered smoke grenades. Already very popular in fields in North America, this opens up all sorts of cool scenario options to Sport Smoke devices. Think of how fun it would be to hook one of these up to a "bomb" you have to disarm. "We are happy to announce the release of our new electrically triggered smoke grenades: the TSG-EF and BFG-EF. 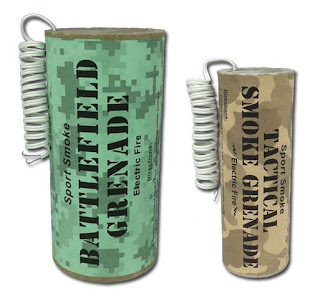 These electric variations of the popular Tactical Smoke Grenade and BattleField Grenade feature an integral squib designed to set off the grenade when connected to an appropriate 9 volt power source. The TSG-EF and BFG-EF are ideal for remote fire applications, hobby applications, and special effects!" Click here for the new grenades, including pricing and purchase information. PenCott Metropolis - An Urban PenCott?